_Members of the Deaf/Hard-of-Hearing Community have diverse communication preferences. American Sign Language (ASL) is the native language of most Deaf/Hard-of-Hearing individuals in the United States and is often the preferred language for communication. Some Deaf/Hard-of-Hearing people use an English -based signing system instead of ASL. Others rely on speechreading. Many Deaf/Hard-of-Hearing individuals will use a combination of all three, along with other visual strategies, depending on the situation. Some members of the Deaf/Hard-of-Hearing community also have vision impairments. Depending on the nature of the visual impairment, these individuals may need the interpreter to make certain adjustments to better accommodate their field of vision, or they may require tactile interpreting. Through our network of skilled interpreters, we can ensure effective communication access for individuals requesting any of these types of interpreting services. The interpretation of spoken messages into ASL and signed ASL messages into spoken English. The interpretation of spoken English messages into an English-based signing system and signed messages into spoken English. The silent repetition of spoken messages, along with gestures to enhance speechreading, and the interpretation of silently mouthed messages into spoken English. 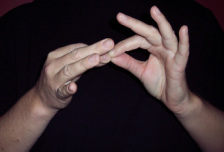 The interpretation of spoken or signed messages into sign language for a DeafBlind consumer who will receive the message by placing their hands on the interpreter. Messages signed by the DeafBlind consumer are interpreted into spoken English.